The digital LED screen poster displays are thin, lightweight displays that are portable so the displays can be positioned in almost any location. The frame colour can also be customised according to the customer requirements. The digital LED screen poster displays can be positioned vertically flat in either portrait or landscape orientation, or they can be slanted vertically at an angle. The digital LED screen poster displays have a specially designed magnetic front service handle to enable users to easily replace any modules if necessary. The digital content can also be updated locally via USB or HDMI, or remotely from any location. Multiple input sources to control content via WIFI, LAN or USB. 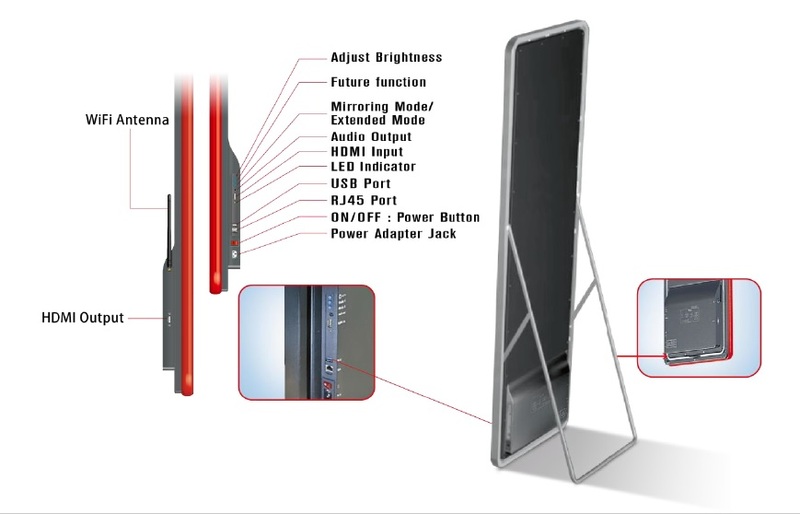 Below are the technical specifications for our digital LED screen poster displays. Technical specifications may change according to the design, so these are for guidance purposes only.